Elaine’s desire to transmit the experience of Continuum Movement led her to making Continuum inspired dances and ultimately to founding Continuum Movement Arts. Please contact her to be part of the movement. In another time and place, Elaine would be a temple dancer, but in this world she is an authorized Continuum Movement teacher, massage therapist, dancer/choreographer and originator of Moving for Health and Dancing for Health classes. 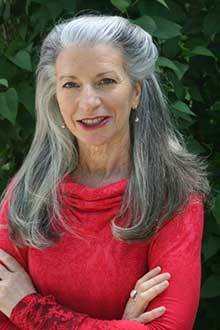 Based in the Hudson Valley of New York, Elaine maintains an active private practice and teaching schedule. Her studio is a haven for fellow somatic explorers. She also offers Continuum Movement and Traveling for Health retreats in Italy. Elaine serves on the Advisory Council and Teachers Review Board for Continuum Movement. Elaine has an M.A. in dance from Columbia University (1982) and was certified as a massage therapist by the Muscular Therapy Institute (1988). Influential teachers include Emilie Conrad (Continuum Movement), Susan Harper (Continuum Montage), Bonnie Bainbridge Cohen (Body-Mind Centering), Lenore Latimer ( Limón Technique), Robert Ellis Dunn (choreography) and Irene Dowd (functional anatomy). Her clients and students as well as health challenges have also served as primary teachers. All artwork on the Continuum Movement Arts website is under the copyright of the individual artists. Continuum Movement tm is the registered trademark of Emilie Conrad Daoud, Inc.